As of today, there are 7 Public Living Rich Couponing Workshops available to attend. You can RSVP using the contact information provided on the link below. 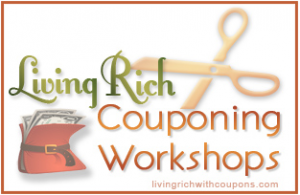 Also, If you are interested in hosting your own Living Rich Couponing Workshop you should do so as soon as possible as space is filling up quickly! The next available dates are starting in December 2011. And, if you live in the Louisville, KY area, I will be in your area around 8/16 – 8/18. If you would like to host a couponing workshop in your area please check out the information at the link below.